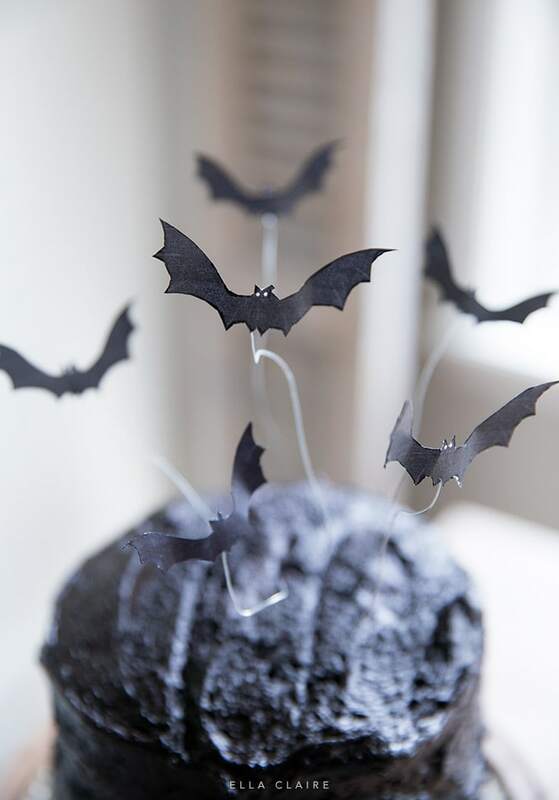 This free printable bat cake topper is an easy and cheap way to make a spooky treat for your family, friends, or even a decoration for a fun halloween party. Is it Halloween Season yet? I love everything about fall, but I feel giddy when I get to decorate, bake and create for Halloween! I don’t know why, but I love every spooky little detail. 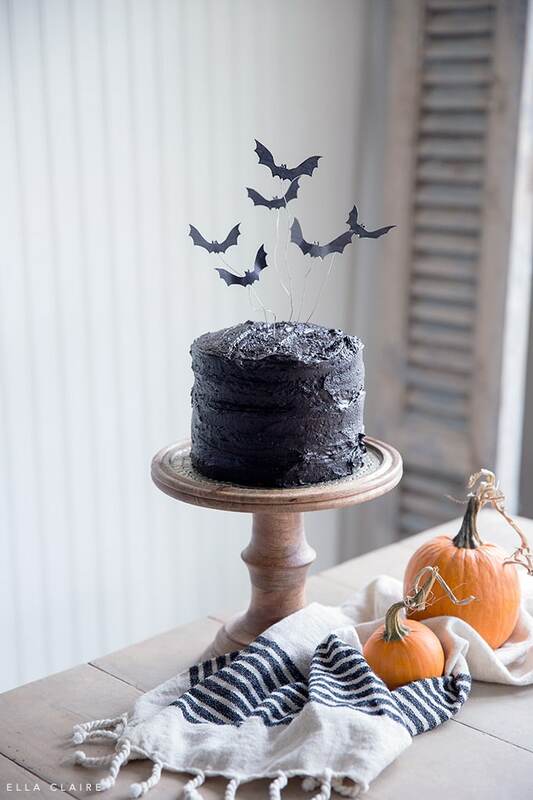 Today I have this fun free printable Halloween bat cake topper along with 20+ others for your home and entertaining this season (below)! Each year, I get so excited to pull out my Halloween totes to decorate, and my littles love to be my helpers. Usually they put on their Halloween jammies and we all decorate together- especially our Halloween Tree. I love to do little projects with bats with them because they are easy and fun for the kids to help. You can see my past bat projects (with free printables) here- Halloween Bat Mantel and Halloween bat tree. but I also change things up a little bit. I love little projects like this because they are so festive while being basically free. I will share these free printable bats below, but first let me tell you about this cake! Look at the inside! I used THIS cake pan set which uses 1 cake mix for all 5 layers. I did an orange cake (white cake with orange coloring) with my black buttercream frosting (recipe HERE). 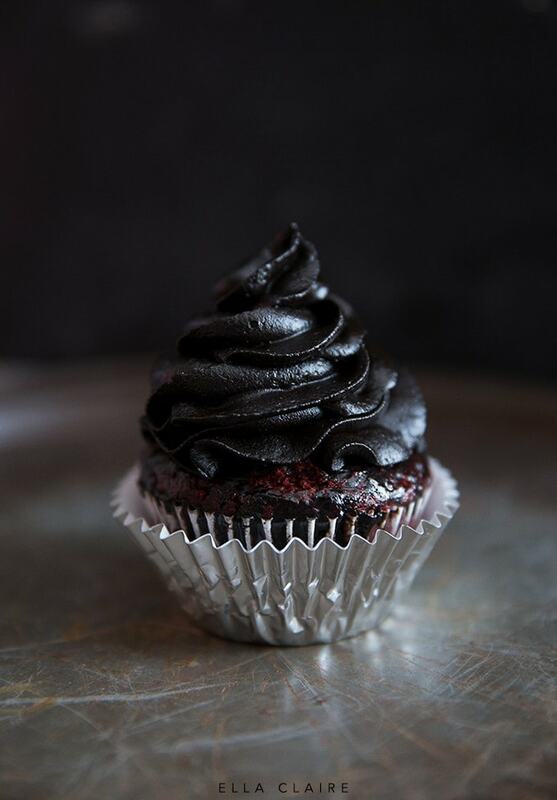 My black frosting has a secret ingredient that makes it black (no food coloring) and it is delicious! It is not even close to being as messy as those cakes with the black food coloring frosting. I recommend making a recipe-and-a-half or a double recipe so you have enough for in between the layers. 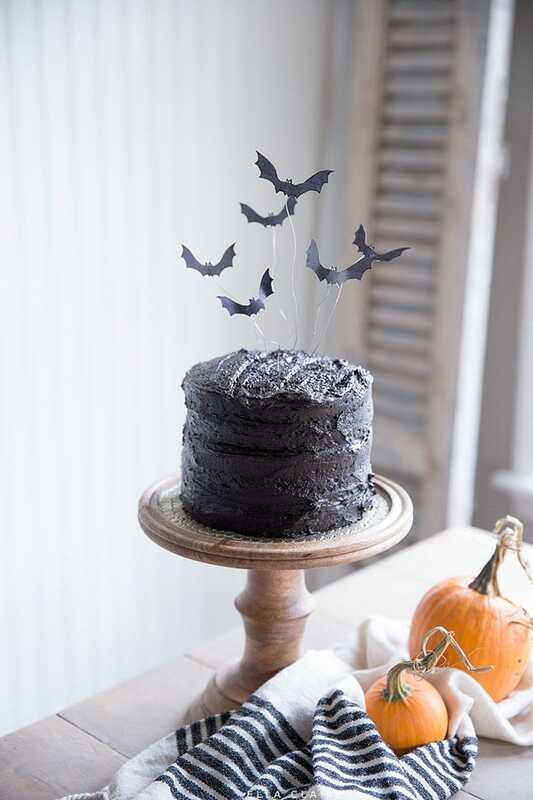 To make the cake topper, I just cut out the bats (download HERE). I used a little bit of silver floral wire, bent around in a whimsical way and attached the bats with a small dot of hot glue. Then I just stuck them here and there into the cake. You could also use straws, lollipop sticks, popsicle sticks and more. Disclaimer- I am guessing that floral wire isn’t exactly food safe, so you might be able to do your own research. I am personally not worried about it but I can’t make that decision for you. You will certainly want to remove any wires before cutting the cake. Here are 20+ more free printables for your Halloween home decor and entertaining! 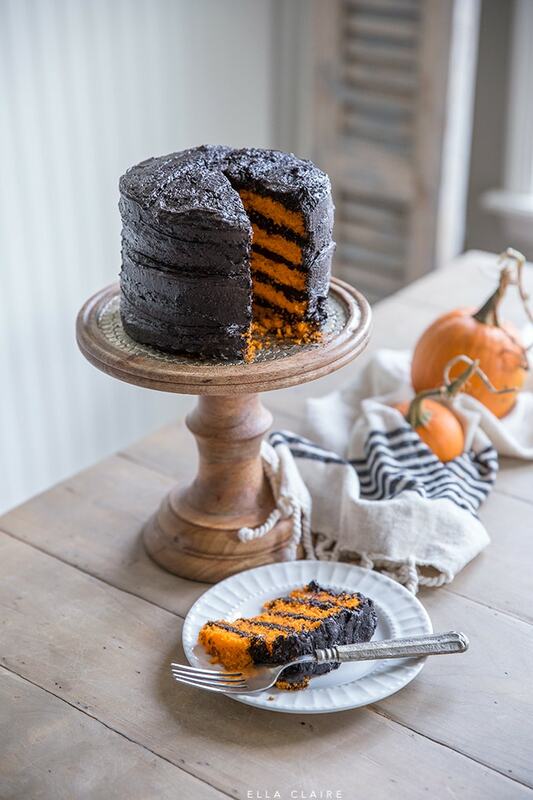 Love everything about this Halloween cake Kristen! 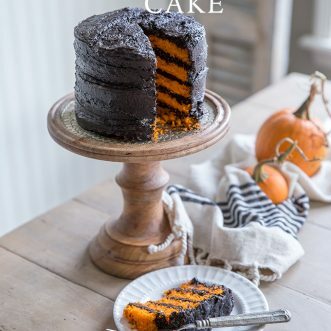 Who knew that it could be so easy to make a black and orange cake!?!? This is the cutest cake ever! The bats are the perfect topper for this orange and black cake! What a brilliant idea! Thanks so much for including me in this fabulous tour! I’m in love with that topper! It’s so cute. And I am so ready to try baking that beautiful cake. I’m not a huge fan of food coloring so I’m excited to try that Black Frosting too! So cute, Kristen! The perfect Halloween dessert! Thanks for organizing today’s tour. I love decorating for Halloween too, Kristen and I don’t know why! 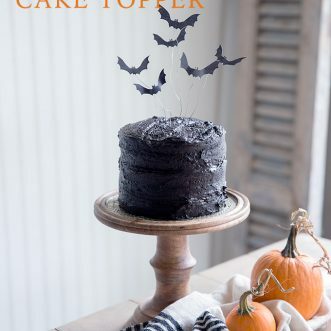 I love this cake and the orange with black icing with those little bats are perfection! This bat cake topper is so cute. I am definitely going to have to make a Halloween cake now! 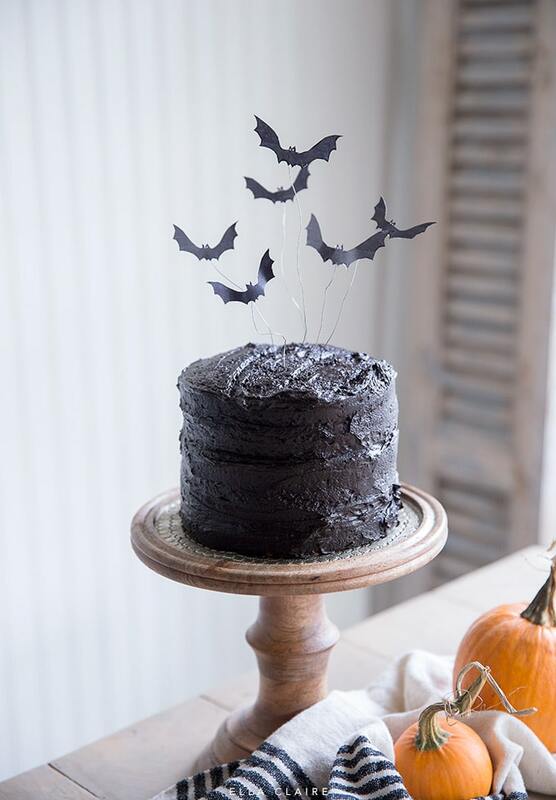 Those bats are perfect for that delicious looking cake! This is ghoulish cool….the orange and black inside and the bats….perfect.